Flirty Aprons is running a $5 Flash Sale in honor of Breast Cancer Awareness. 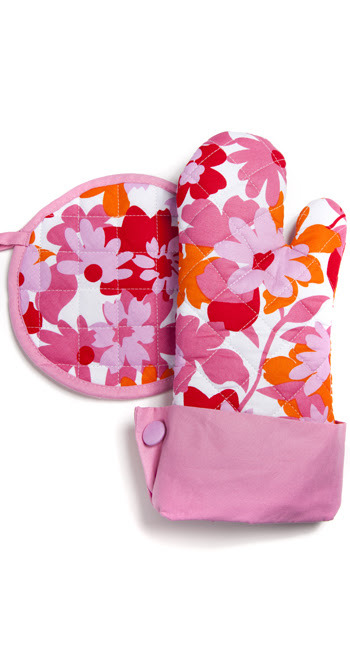 You can get this cute pot holder and oven mitt set for just $5 SHIPPED! That is a fantastic deal and a great hostess or teacher gift to stock up on. In addition to this fantastic deal, Flirty Aprons has all their aprons on this page at 40% off! My favorite are the mother-daughter matching sets, so cute for you both to be in the kitchen. After the 40% off this sets all aprons between $9-11 dollars each, which is a great deal on these super cute aprons. All 4 aprons pictured above are the patterns with matching adult/child aprons.